I recently purchased a few new make-up brushes from Zoeva’s dreamy Rose Gold Collection so I thought now would be a good time to write a review as I’ve now amassed a total of ten brushes! 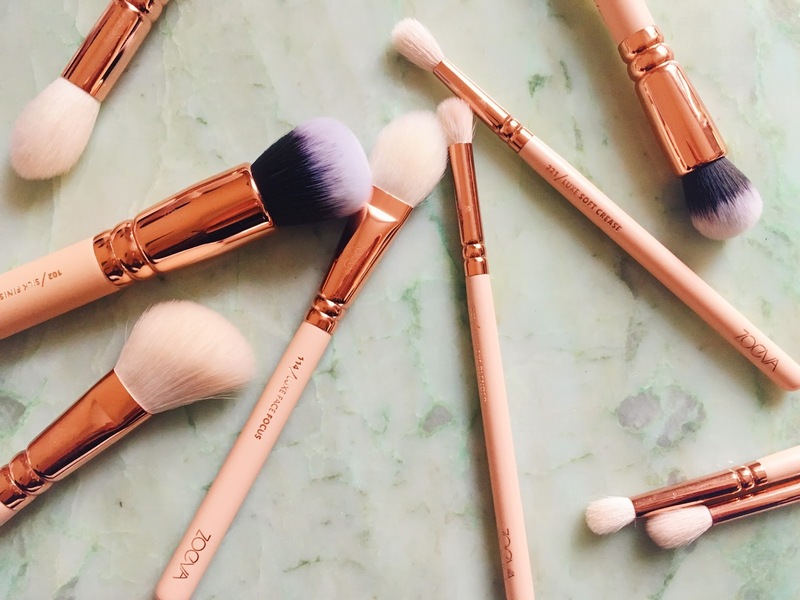 I instantly fell in love with the beautiful, light peach handles and rose gold ferrules and knew that I was about to embark on a new, quite expensive obsession. After purchasing a few eyeshadow brushes, my other brushes looked so ugly in comparison that I had to keep on purchasing more! I was worried about the quality of the brushes being less than their beauty but I have been consistently impressed. In fact, impressed enough to subsequently give away all of my other brushes to my mum! Left: Top- down: Luxe Crease, Luxe Petit Crease, Luxe Soft Crease, Luxe Eye Blender. Right: Top-down: Luxe Sheer Cheek, Luxe Highlight, Face Shape, Silk Finish, Powder, Luxe Face Focus. Silk Finish: I bought this brush to replace my beloved buffing brush from Real Techniques (which is an absolutely brilliant brush and has now been gifted to be loved by my mum). This is an amazing brush to apply foundation with and blend over my contour, the foundation blends so easily and quickly into the skin and looks flawless. 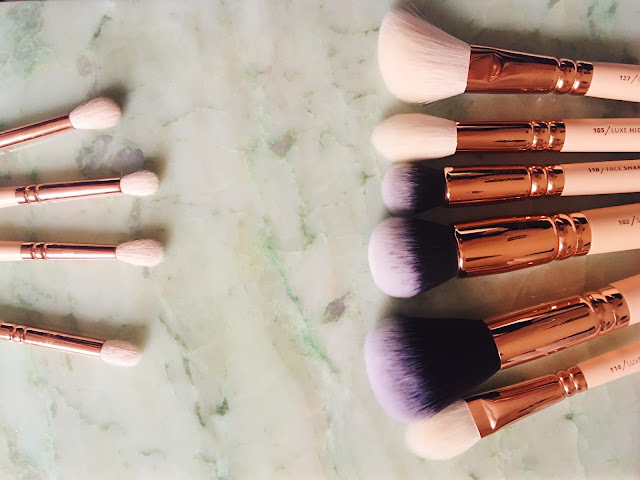 Luxe Face Focus: I use this brush to set my under-eyes with powder. The shape of this brush is perfect due to its pointed tip and flat shape to get right under the lashes where I usually tend to crease. Luxe Sheer Cheek: I’m terrified of overapplying blusher so the name of this brush was what first grabbed my attention. It’s the ideal size for my cheeks and has an angled shape which really helps me control exactly where I want my blush to go. The brush is then also dense enough to blend it out smoothly for a lovely, sheer wash of colour. Face Shape: This is great, dense brush to applying contour and blending it out. It’s super soft due to the vegan taklon fibres and makes contouring super easy; it’s the perfect size to fit in the hollows of your cheeks! Luxe Highlight: I was planning on using this for contouring and highlighting but so far, I’ve just used it for highlight. This was supposed to replace my Real Techniques contour brush but the Face Shape brush has taken that job! This applies powder highlight beautifully. 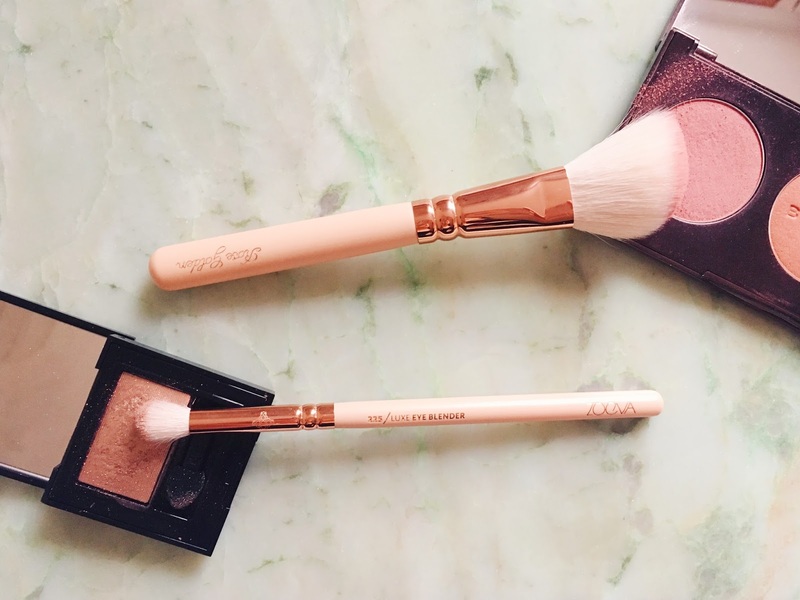 Powder: This brush is super soft and it seems to pick up my powder pretty well! It’s a great size for dusting powder all over the face quickly. Luxe Eye Blender: I use this to apply eyeshadow to the lid and blend it out for a nice, subtle wash of colour. It’s also great to blend out dark eyeshadows first, before going in with a crease brush. Luxe Crease and Luxe Soft Crease: I accidentally bought the same brush twice it seems. These brushes are basically identical twins with perhaps the most minor differences. I just use these to blend out eyeshadows to finish off a look. Luxe Petit Crease: This is the perfect brush for precisely putting eyeshadow into the crease. It’s tiny tapered head allows you to get right into the socket. I do however find this brush a little scratchy but I don’t care all that much because it’s so damn cute. These brushes are amazing quality for the price and the design is so pretty. The majority of the brushes are super soft (except for the petit crease!) and blend make-up beautifully. The packaging they arrive in feels so luxurious and the fact that all of their brushes are cruelty-free is a great bonus. Zoeva have even taken the care to provide brush guards for some of the brushes with help preserve them and prevent them from splaying. I'm in love with these brushes and I can’t wait to grow my collection!